Having recently purchased a Samsung SM961 PCIe MVMe SSD I was shocked to find that my write speeds were only 350MB/s. I have the SM961 installed in a Lycom DT-129 PCIe card but I only have a x4 PCIe 2.0 slot on my current motherboard. When I purchased the SM961 I was aware that my speeds would be impacted by the PCIe 2.0 slot but did not anticipate such poor Write speeds. With it being an OEM product the SM961 also has no drivers supplied and at the time of writing this article Samsung and no other PC manufacturers appear to have posted optimised drivers. I was aware that Windows 10 provides native NVMe driver support and expected reasonable performance from them. Unhappy with the Write speeds I started to experiment and eventually found that if I disable windows write cache buffer flush in Device Manager then my Write speeds jump to just over 800MB/s which I can happily live with. 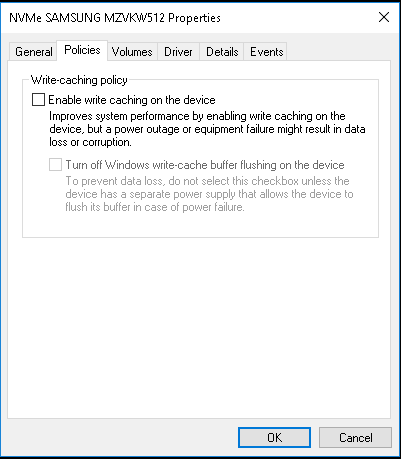 I then tested with write caching enabled and write-cache buffer flushing disabled. I would be interested to hear for you so please do post your feedback or questions. Disclaimer: Please ensure that you have and maintain a full backup of all your data before making any changes to your system. These changes may make your system more susceptible to data loss should a power failure occur whilst your system is in operation.